This fall a number of wonderful friends made gifts of $558 to purchase each of our new band uniforms. It has taken forever to get the uniform manufactured once we placed the order. Dr. Girtmon brought by for me to see the final sample this week. 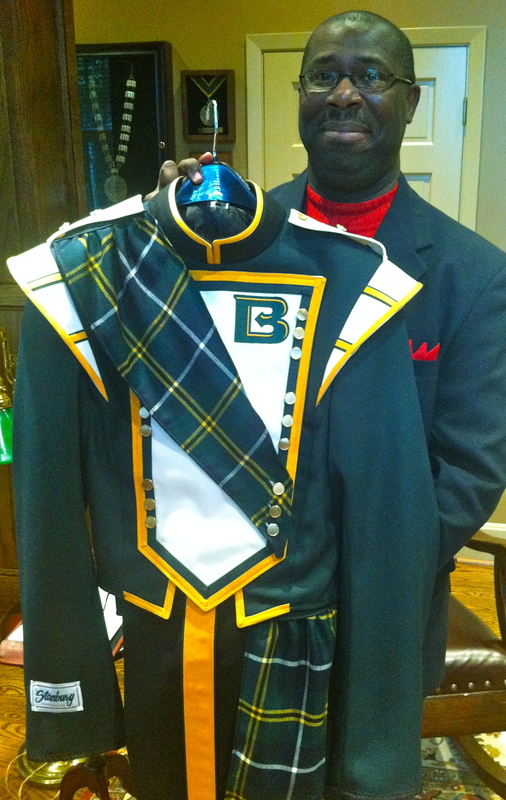 Here is a picture of the uniform, held by Dr. Paxton Girtmon, our Director of the Bands. 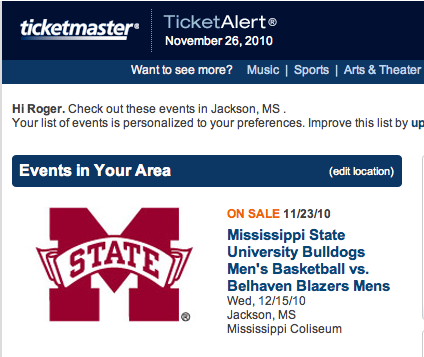 This promotion came to my email over the weekend from Ticketmaster. We’ll start getting information out on the Belhaven University Athletics web site about how to purchase tickets. Thanksgiving is a time to look back, not to look ahead – forward projecting comes at the end of this season of holidays, with New Year’s Day as the other bookend. Those first 53 surviving Pilgrims from the Mayflower celebrated Thanksgiving in 1621 because it was an English tradition to have a feast at the end of the harvest when the work was done for the year. But for the Pilgrim’s first thanksgiving at Plymouth, they had very little – and these were people who during that year built 7 times more graves than huts, and had come very close to giving up and returning to England. So for them, Thanksgiving was celebrated NOT because they had so much. Rather, it was a time to look back and reflect on how far God had brought them with so little. This Thanksgiving, I hope you’ll find time to look back and remember how far God has brought you. Four thousand of the world’s most influential evangelical leaders attended the Congress in Cape Town, but one 18 year old girl in her school uniform brought them to humility before God. We heard speakers who lead the huge ministries and churches. But no speaker reached the Congress as did this this girl who shared the story of her family in North Korea. This amazing moment will always be remembered as the high point of the the Lausanne Congress – when a humble high school girl showed us genuine Godly leadership. P.S. This video is being shown with her permission. In a come from behind win, the men’s soccer team beat the University of St. Thomas 2-1 this afternoon in the opening round of the National Tournament. We now move on to the round of 16 teams who will compete in Orange Beach Alabama. We will play the host team, University of Mobile, on Tuesday evening, November 30th at 7:30 pm. The game will be held at the Orange Beach, Alabama, at the Orange Beach Sportsplex, just off Canal Road south of the Foley Beach Express toll bridge. This will be the last opportunity to see our team at home – and this is a big game, so we need a great crowd. Many of our players have also been recognized with significant awards. Here is the full list. Each month we send to pastors an email filled with helpful statistics and news of the Church and society. This may be of interest to you (you don’t need to be a pastor), and you’re welcome to subscribe on our Church Relations Web page. Or you may want to pass this resource on to your pastor. Below is the November’s issue which was sent today, or you can read it HERE. This is going to be fun . . .
For the first time since Belhaven winning of the National Championship in 1992, the men’s soccer team has earned a bid to the tournament. We will be one of 31 teams in the 2010 NAIA Men’s Soccer National Championship Tournament. The Blazers, ranked 10th in the Final NAIA Coaches’ Top 25 Poll and 8th in the NAIA Men’s Soccer Modified Ratings Percentage Index (RPI) Poll. Will host St. Thomas University (TX) in the Opening Round at H.T. Newell Field this week – Saturday at 4:00. Belhaven (15-1-3) earned one of seven at large bids after being eliminated on penalty kicks from the Southern States Athletic Conference Tournament in a 0-0 double overtime tie to Southern Polytechnic University Thursday afternoon. The Blazers are the eighth seed and will be making their seventh overall appearance in the national tournament. If we advance to the second round of the championship, the games will be played in Orange Beach, Alabama, at the Orange Beach Sportsplex, just off Canal Road south of the Foley Beach Express toll bridge. 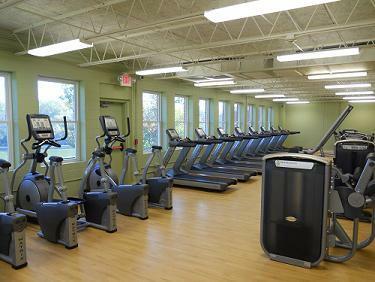 The most requested missing piece of our student life needs is that of a fitness center. After a long process of fund raising and construction, it is now open and ready for use by all our full time students, faculty, and staff. The athletic teams will continue to have their separate facility for training, but this new center will be for the rest of the campus. Thanks to Wirt and Linda Yerger and Blue Cross/Blue Shield of Mississippi for making such strong lead gifts to make this new center possible. And thanks to Kevin Russell who did a wonderful job leading the charge all the way through, and wouldn’t let this project slip away. Thanks to lots of other folks who also gave and worked to build this center, and I’m especially grateful for the spirit of our students in being so patient – this project took longer than any of us wanted it to take. Coach Steve DeCou, our Men’s Soccer Coach has been named Coach of the Year by the Southern States Athletic Conference. This is a special honor because four of the 13 teams in our conference are nationally ranked. The Men’s Soccer Team will be playing Southern Polytechnic State (GA) tomorrow at 3:00 pm in Gulfport in semifinal round of the SSAC Conference championship. If we win tomorrow we will advance to Saturday’s SSAC conference final in Gulfport.